Looking for a Free Printable Birthday Invitation? It can be hard to find the right party invitation for a special event. 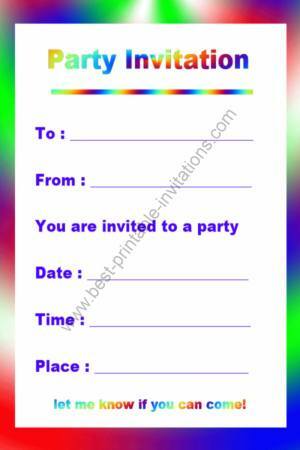 This bright and colorful invitation would suit both a child or adult party. The colorful borders almost seem to make it glow. How about using it for a kids 'rainbow' party, or for an adult retro event. 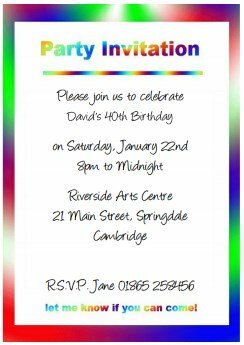 If you are looking for something a bit different - then this invite should fit the bill perfectly. These bright, fun birthday invites are printed 2 per page to save you time (and ink!). Just cut apart and fill in your party details. Then send it out in plenty of time for your guests to respond. Simply scroll down and choose your paper type (A4 or letter). Select the links to open the invitation in a new window, ready for printing. I made this free invite as bright and fun as possible - while keeping it simple. 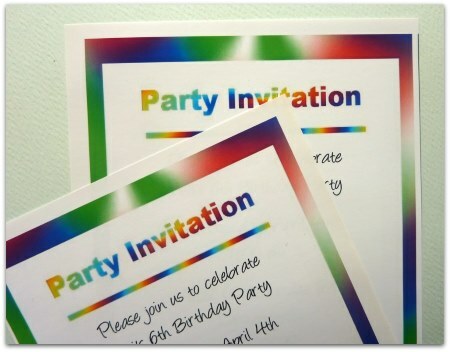 The colorful border makes a bright surrounding to your party details. Not quite what you had in mind? Don't worry! Try these free printable birthday party invitations instead. Rushed for time? Get a personalized version for immediate download! Use the form below to type exactly what you would like your invitation to say. See how it looks by pressing preview. Be sure all details are correct BEFORE you buy! This lovely invite looks fabulous just printed - but is easy to make unique. It is already quite sparkly, but why not fill out your celebration details with a gold or silver metallic pen - or a nice brightly colored gel pen. A touch of glitter looks nice - or just add a little into the envelope for a sparkly surprise! It is best to send out the invites at least two weeks before your birthday - and longer if it is an adult event. Be as organised as you can when writing out the invitations. What details do your guests need to know? Make a list of guests and mark them off as you finish each invite and put it into the envelope. A map and directions would help your guests too! Keep your guest list handy and you can use it to mark your RSVP's as you get them. That will help you have a clear idea how many people to cater for.